Go Daddy saw its customers transfer their accounts in their thousands, online campaigners have mobilsed and forced other companies to withdraw their support and Google, Amazon, Facebook, Yahoo and several other Internet companies are said to be considering taking their services offline in protest. Whilst Internet-based companies have incurred the wrath of their anti-SOPA users and customers, hundreds of other supporting companies are not as easy to influence. However, that could be set to change with the launch of ‘Boycott SOPA‘ a new Android application that allows users to scan barcodes of different products to identify if the company that makes or sells it is a supporter of the Stop Online Piracy Act. If you’re wondering what SOPA is all about, check out our guide which explains how it will affect the Internet and you, the user. Boycott SOPA was created by two college students that were “unimpressed with the current SOPA bill and want to discourage it from getting passed in any way possible,” allowing its users to take action against SOPA-backing companies by boycotting or completely avoiding their products. 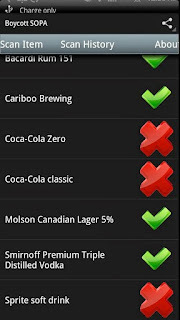 At the time of writing, the app can identify products connected to over 800 brands or companies and is continually being updated. 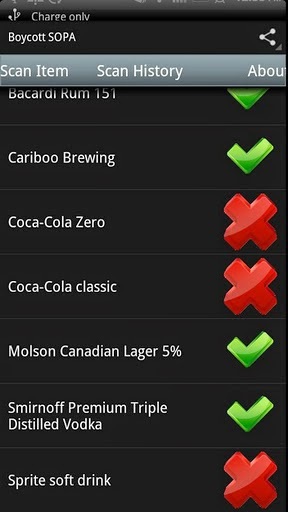 As its creators note, “it is intended as an aid to identifying such products but should not be relied upon,” adding that its users “should carry out [their] own check in case of any product this app indicates is a product of a company supporting SOPA is not”. The app itself requires only Internet permissions on an Android device. However, it does require the barcode scanning app made by the ZXing (Google/Open Source) team to process the image and decode the barcode. 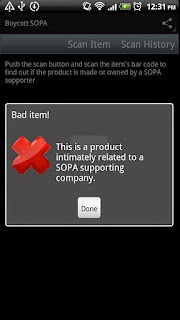 The Boycott SOPA team says that their app makes one request to its server to find out if the product is made by a SOPA supporter and does not request or send any other data. Lifehacker has also compiled a few extra tools that can aid you in taking the fight to those backing SOPA. 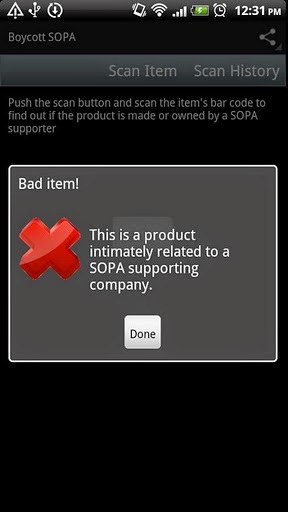 Boycott SOPA is a simple app with a common goal; with enough users it might be able to help make an impact on SOPA-supporting companies, but it’s a huge ask. It will allow those who are staunchly against the new bill to carry out their own protests against these companies, impacting brands online and offline.